Business listings / profile pages are to ensure they are compliant with the usage rights of trademarks and logos within the informaiton that is being presented to the public. This website, mypetgroomer.co.uk and its owner, The British Isles Grooming Association (BIGA), accept no liability for the misrepresentation of business listings on this site. However, we will do our best to ensure there is no misrepresentation and take steps to enforce correct usage of logos and trademarks by businesses listed on mypetgroomer.co.uk including lifetime bans for those individuals or businesses who are found deliberately to be misleading visitors to, and users of, this website. 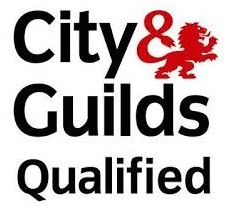 The City & Guilds Qualified logo is available to learners who have achieved a Level 2 City & Guilds qualification or higher. The logo includes a descriptor that shows the level of the qualification you have achieved. The level descriptor is a recent addition that safeguards consumers against the level of expertise they can expect to receive from a tradesman as well as allowing learners to become more competitive by completing qualifications of a higher level. If you wish to apply for the City & Guilds Qualified logo, please email your request with scanned copies of your certificates to logo@cityandguilds.com. To ensure you receive the correct logo, please only send copies of the certificate with the highest level qualification you have completed. Please note: Certificates of Unit Credit are not accepted as evidence that you have completed a qualification. Please visit www.icmguk.com for more information about logo usage and brand guidelines.